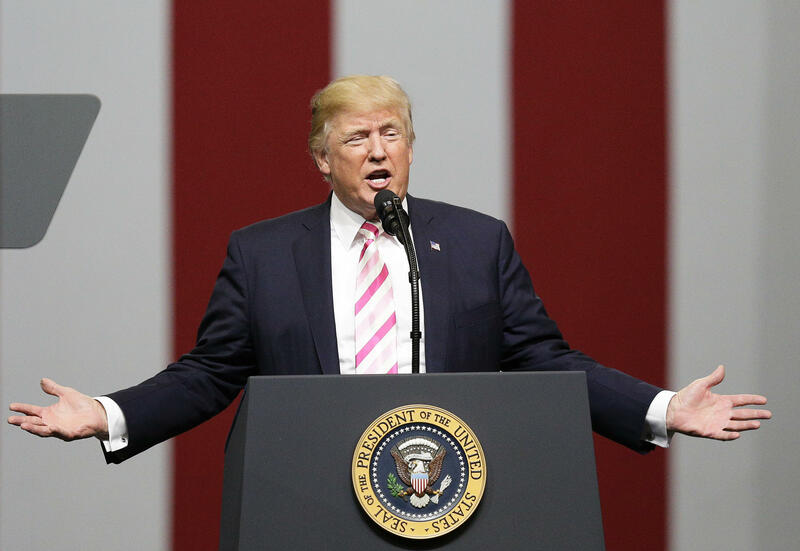 HUNTSVILLE, Ala. -- President Trump has some advice for National Football League owners: Fire players who kneel during the national anthem. He's also encouraging fans to walk out in protest. And the president is bemoaning what he describes as a decline in violence in the sport. "They're ruining the game," he said during a political rally in Alabama on Friday night that veered beyond politics. NFL Commissioner Roger Goodell released a statement Saturday morning in response to Mr. Trump's comments. "Divisive comments like these demonstrate an unfortunate lack of respect for the NFL, our great game and all of our players, and a failure to understand the overwhelming force for good our clubs and players represent in our communities," Goodell said. Tom Brady: "I wonder what the next 10 years will bring"
Mr. Trump, who once owned the New Jersey Generals of the U.S. Football League, says those players are disrespecting the American flag and deserve to lose their jobs. "That's a total disrespect of our heritage. That's a total disrespect of everything that we stand for," Mr. Trump said, encouraging owners to act. "Wouldn't you love to see one of these NFL owners, when somebody disrespects our flag, you'd say, 'Get that son of a b---- off the field right now. Out! He's fired," Mr. Trump said to loud applause. Mr. Trump also predicted that any owner who followed the presidential encouragement would become "the most popular person in this country" -- at least for a week. The NFL Players Association reacted to Mr. Trump's comments Saturday morning in a statement. "We will never back down. We no longer can afford to stick to sports," executive director DeMaurice Smith said. "This union ... will never back down when it comes to constitutional rights of our players as citizens as well as their safety as men in a game that exposes them to great risks." Mr. Trump, who was in Alabama campaigning for Sen. Luther Strange, also blamed a drop in NFL ratings on the nation's interest in "yours truly" as well as what he contended was a decline in violence in the game. Is Hurricane Irma to blame for week one of NFL ratings? During his campaign, Mr. Trump often expressed nostalgia for the "old days" -- claiming, for example, that protesters at his rallies would have been carried out on stretchers back then. He recently suggested police officers should be rougher with criminals and shouldn't protect their heads when pushing them into squad cars. Mr. Trump said the anthem protest was the top reason NFL viewership had waned. Mr. Trump encouraged his supporters to pick up and leave the stadium next time they spot a player failing to stand.